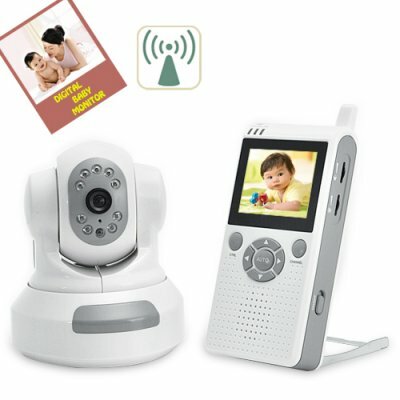 Successfully Added Wireless Baby Monitor with Night Vision (Video) to your Shopping Cart. Keep an extra pair of eyes (and ears) on your baby from anywhere in the house with this Wireless Baby Monitor, which features night vision and remote pan/tilt control. With this Wireless Baby Monitor, you finally have the freedom to watch TV, entertain guests, do household chores, exercise, and even sleep with peace of mind that you will always know when your baby needs you. A 2.5 inch LCD screen lets you to keep an eye on the little ones without having to wake them, while the built-in mic allows you to hear their every cry and yell. If you have a toddler who likes to crawl around the room, you'll absolutely love the Wireless Baby Monitor's ability to remotely adjust the camera from the receiver. With both tilt (up to 120 degrees up and down) and pan (up to 270 degrees left and right) functions, not only can keep you keep an eye on your children at all times, but you can even remotely scan their room for any dangerous items or objects that shouldn't be there. Designed specifically with you and your baby's needs in mind, this Wireless Baby Monitor includes 9 infra-red lights for night vision that will automatically go to work and provide a nice bright view of your baby. Those 4 AM checkups are no more, since all you need to do is take a quick glance at the baby monitor to know that your little one is sleeping as well as you are. If your friends or family have a small one at home, buy them a Wireless Baby Monitor to show that you care. In stock now and available at a parent-friendly price, order today and we'll express ship it out tomorrow! Brought to you by your best source of wholesale electronics, Chinavasion. Will this baby monitor work at night? Yes, there are 8 infrared lights working to guarantee excellent night vision. Do I have to automatically turn on night vision? No, it automatically turns on once it is too dark. Is this Wireless Baby Monitor in black/white or color? Color. At night, it is black/white. It works as advertised. Came with 2 adapters for North America outlets, which was a nice bonus, since I am in Canada. First impression was that the monitor was bigger than I thought it would be, it's tall as a can of coke, thick as a tv remote. I thought the video display was in black and white, but it is in color, I think it's just set up to pick up details more, darks are light grey. I know it is in color is because I saw sunlight going through a bottle of tequila in a window and it was orange. :) Range is good, can have static with video and audio, but not too bad. The remote control rotation of the camera is quiet. I can't compare it to other baby monitors with video, but it works and the price is right. I feel much safer around the home now that I've installed this. I'm thinking of buying a couple more.